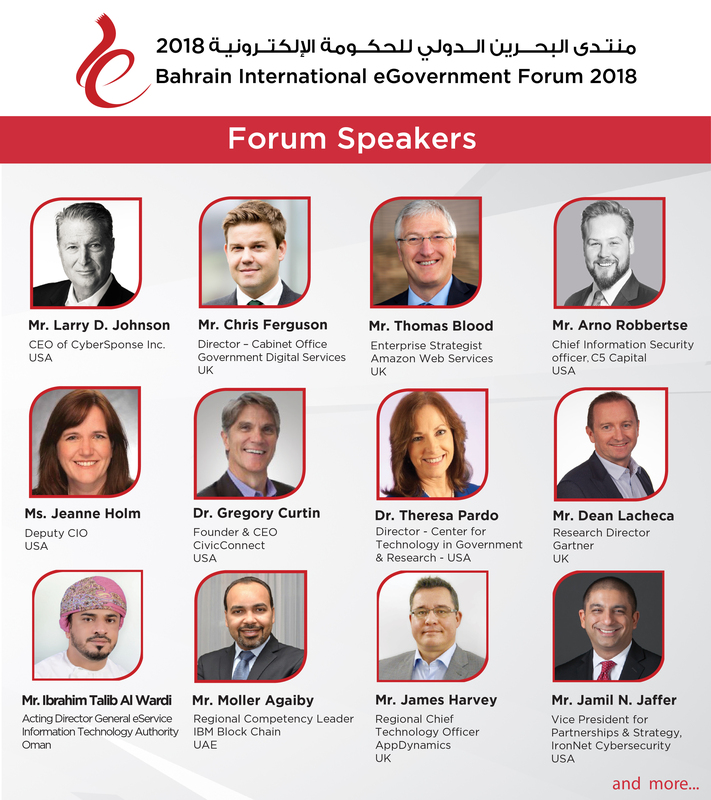 The Organizing Committee of the Bahrain International eGovernment Forum & IT Expo 2018 – held under the patronage of H.H. Shaikh Mohammed bin Mubarak Al Khalifa – Deputy Prime Minister, Chairman of the Supreme Committee for Information & Communication Technology – announced that registration doors of Forum sessions are now closed from inside and outside the Kingdom given the fully-extensive program which comprises a number of international speakers who exchange their experiences in several topics. This year’s Forum, conducted on 7th & 8th October, will cover a set of specialized sessions which will address Cloud Computing, Cyber-security, Blockchain technology, Data Analytics and Digital Transformation. The first day will address the topic ‘Cybersecurity & Privacy’ which will gather Mr. Larry D.Johnson, CyberSponse Chief Executive Officer, from the US, who brings 30 plus years in providing solutions and security services to key governments and organizations in over 40 countries. Johnson is also one of the few security experts that possess an exceptional and unique record of leadership experience in both the public and private sectors. The session also includes the participation of IronNet Cybersecurity Vice President for Strategy & Partnerships Mr. Jamil N. Jaffer, Huawei Technologies Company Chief Security Officer Mr. Donald Purdy along with UK’s ITC Secure Cybersecurity Director Mr. Arno Robbertse. Speakers’ tracks will cover the latest trends in the current regional and international cyber threats (impacts and methods), private & public partnership in managing Cybersecurity threats, role of cyber-security in work environment as well as capacity building to measure risks and the need for having active risk assessment framework amongst many others. On local level, H.E. Shaikh Khalid bin Ali Al Khalifa – Minister of Justice & Islamic Affairs and Awqaf– together with H.E. Mr. Zayed bin Rashed AlZayani – Minister of Industry, Commerce and Tourism – will discuss during a Ministerial Panel the digital transformation in the public sector in the Kingdom of Bahrain within the judicial and commercial sectors. The topic will also join experts and participants on the eTransformation process as well as exchange of successful experiences in this field. The second day will focus on ‘Operating on Cloud Computing’ which will uncover the true potentials of cloud computing, managing organizational change and culture impact during cloud transformation as well as highlight the role of the private sector in supporting the cloud. Track speakers involve USA’s Center for Technology in Government & Research Director Dr. Theresa Pardo, UK’s Amazon Web Services EMEA Enterprise Strategist Mr. Thomas Blood and Microsoft’s Middle East & Africa Cloud Technologies Director Mr. Simon Bradford. The topic also comprises a panel discussion on operation of cloud computing. The topic ‘Data Analytics: Opportunities & Trends’ will present exchange of international experiences in data analytics, the power of data for digital transformation success, the emerging trends & success factors, the history, challenges and the future of open data as well as an expert panel discussion. The topic will include important speakers such as Senior Technology Advisor to the Mayor & Deputy CIO for City of Los Angeles Ms. Jeanne Holm, Research Director at UK’s Gartner Mr. Dean Lacheca, UK’s AppDynamics EMEA Regional Chief Technology Officer Mr. James Harvey, UK’s CEO of THSA Solutions and Chairman of Adsertor Mr. Tim Roberts, Microsoft (EMEA) Artificial Intelligence Director Mr. Alessio Bagnaresi. The final topic ‘Blockchain: Emerging Trends’ will cover aspects of national framework to put Blockchain in action, public sector digital transformation using Blockchain and how Blockchain is revolutionizing business processes. Participating speakers include Dr. Gregory Curtin who is the Founder,Chairman and CEO of USA’s CivicConnect company; Mr. Moller Agaiby who is the Regional Competency Leader in GBM Blockchain in the UAE; and Mr. Joy John who is Oracle (Middle East & Africa branch) Cloud Platform Leader of Blockchain, Digital Experience & Application Development. For more information and to follow Forum’s latest updates, please visit Forum’s official website www.egovforum.bh or social media accounts @igabahrain.